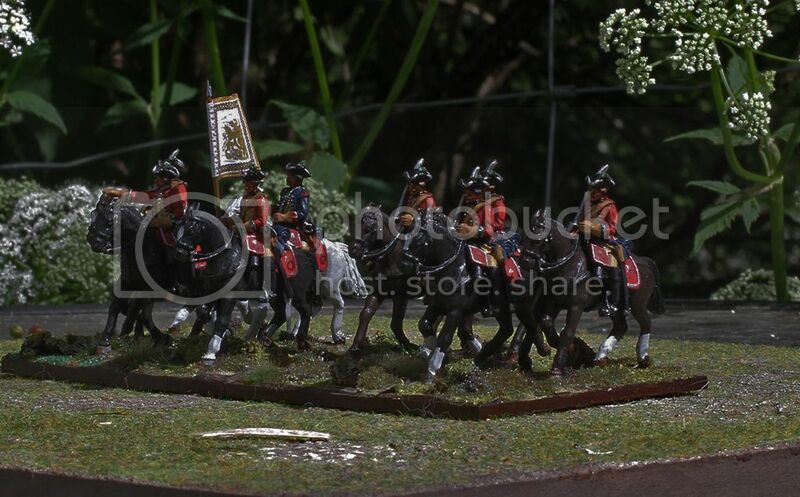 Minden miniatures and Maverick Flags. I agree, very nice. Hanoverians are my all time favorite army from the late 1600's to the Franco/Prussian War. Enjoyed seeing these. Very nicely done. Sorry to mention this though, but all members of the Gardes du Corps rode grey horses- not just the trumpeters…..
Also- the trumpeters wore the British Royal livery- Red coats faced blue heavily laced with gold- very like today's British Household Cavalry musicians but with tricornes. This was because the Electors of Hanover were also Kings of England, so the musicians adopted the 'senior' livery of their monarch. The Kronosaf site quotes 'reversed' colours for the GdC but that is one of its errors. The GdC are shown in the famous picture 'Die revue bei Bemerode' which can be Googled. They wore the same uniform in the SYW. A nice paint job indeed. And a great unit selected here. Are you sure about your trumpeter's uniform information? I only recently painted mine in blue dress. Shell-Shock-Hell-Aflame!!! My trumpeter is also dressed in blue. He looks great, I must say. Well – I should add, I'm not so good a specialist on uniforms – more so on guns. Yes- like the Footguards' musicians- they wore British Royal Livery. The GdC were strictly speaking part of the Electoral Household rather than the army, and aside from being correct by the traditional standards of heraldry, it was also a display of the legitimacy of the Hanoverian succession to the British throne. Interestingly the Irish Regt 'Roth' in the French army, descended from James II's Footguards- also dressed its musicians in British Royal livery as a demonstration of Stuart's continuing claim on the throne. Anyway- check the Bemerode painting. Always be careful using the Kronosaf site and check other sources where you can- it's a fantastic resource but quite a few errors hidden within it. IIRC I think Kav 1A Leib Regiment also wore this livery for their musicians. Very nice – and I would not have noticed the horse colour! It is the contemporary painting of the Hanoverian army at Bemerode. Images 2 and 4 (they are rather small but quite clear) show the Gardes du Gorps with their musicians wearing the British Royal Livery, very similar to the UK Household Cavalry of today. The Hanoverian mounted and foot guard musicians wore this livery because of their Elector's additional and 'higher' title as British King. This was worn till 1803 when Hanover was effectively dissolved.